Make a large number of changes in an idf file with a few lines of eppy code. Make changes to multiple idf files. 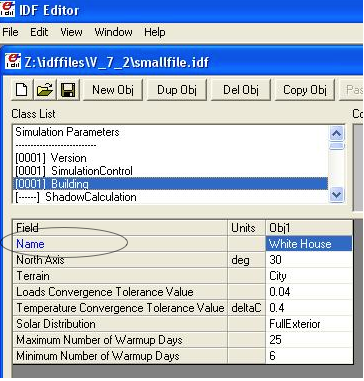 Read data from the output files of a E+ simulation run. Based to the results of a E+ simulation run, generate the input file for the next simulation run. Change construction for all north facing walls. Change the glass type for all windows larger than 2 square meters. Change the number of people in all the interior zones. Change the lighting power in all south facing zones. Change the efficiency and fan power of all rooftop units. If a model is using more energy than expected, keep increasing the R-value of the roof until you get to the expected energy use. idf1 now holds all the data to your in you idf file. Now that the behind-the-scenes work is done, we can print this file. Looks like the same file as before, except that all the comments are slightly different. We can also zoom in on the object and look just at its individual parts. For example, let us look at the name of the building. To do this, we have to do some more behind-the-scenes work, which we’ll explain later. Now that we’ve isolated the building name, we can change it. building.Name = "Empire State Building"
Did this actually change the name in the model ? Let us print the entire model and see. Yes! It did. So now you have a taste of what eppy can do. Let’s get started! That was just a quick example – we were showing off. Let’s look a little closer. object.fieldname = "New Field Name"
But how did we know that “Name” is one of the fields in the object “building”? In the IDF Editor, the building object is selected. We can see all the fields of the object “BUILDING”. Let us try to access the other fields. How about the field “North Axis” ? It is not a single word, but two words. In a programming language, a variable has to be a single word without any spaces. To solve this problem, put an underscore where there is a space. So “North Axis” becomes “North_Axis”. Where else can we find the field names? The IDF Editor saves the idf file with the field name commented next to field. This a good place to find the field names too. It is easy to copy and paste from here. You can’t do that from the IDF Editor. We know that in an E+ model, there will be only ONE “BUILDING” object. This will be the first and only item in the list “buildings”. But E+ models are made up of objects such as “BUILDING”, “SITE:LOCATION”, “ZONE”, “PEOPLE”, “LIGHTS”. There can be a number of “ZONE” objects, a number of “PEOPLE” objects and a number of “LIGHTS” objects. So how do you know if you’re looking at the first “ZONE” object or the second one? Or the tenth one? To answer this, we need to learn about how lists work in python. Eppy holds these objects in a python structure called list. Let us take a look at how lists work in python. # fruits is a list with three items in it. But calling the first fruit “fruit” is rather cumbersome. Why don’t we call it firstfruit? As you see, we can call that item in the list whatever we want. To know how many items are in a list, we ask for the length of the list. The function ‘len’ will do this for us. There are 3 fruits in the list. Let us open a small idf file that has only “CONSTRUCTION” and “MATERIAL” objects in it. You can go into “../idffiles/V_7_2/constructions.idf” and take a look at the file. We are not printing it here because it is too big. Let us print all the “MATERIAL” objects in this model. As you can see, there are many material objects in this idf file. The variable “materials” now contains a list of “MATERIAL” objects. You already know a little about lists, so let us take a look at the items in this list. To understand what you can do with your objects organized as lists, you’ll have to learn a little more about lists. You should remember that you can access any item in a list by passing in its index. The tricky part is that python starts counting at 0, so you need to input 0 in order to get the first item in a list. But there’s another way to access items in a list. If you input -1, it will return the last item. -2 will give you the second-to-last item, etc. How do I make sense of this? The slice operation bad_architects[1:3] slices right where the numbers are. I’ll let you figure that out on your own. This is simple: the append function adds an item to the end of the list. What if you know the index of the item you want to remove? What if you appended an item by mistake and just want to remove the last item in the list? You can also remove the second item. Notice the ‘bacon’ in the line above. pop actually ‘pops’ the value (the one you just removed from the list) back to you. Let us pop the first item. That is not much of a breakfast! Let us get back to eppy. With our newfound knowledge of lists, we can do a lot of things. How about the last two? How many materials are in this model ? Success! We have only 9 materials now. So far we have been working only with materials that were already in the list. What if we want to make new material? Obviously we would use the function ‘newidfobject’. We have 11 items in the materials list. Looks a little different from the other materials. It does have the name we gave it. Why do some fields have values and others are blank ? “addobject” puts in all the default values, and leaves the others blank. It is up to us to put values in the the new fields. I’m tired of doing all this work, it’s time to make python do some heavy lifting for us! Python can go through each item in a list and perform an operation on any (or every) item in the list. This is called looping through the list. Here’s how to tell python to step through each item in a list, and then do something to every single item. We’ll use a ‘for’ loop to do this. It’s elegant, but it means that the indentation of the code holds meaning. So make sure to indent the second (and third and forth) lines of your loops! Now let’s make some fruit loops. Given the syntax I gave you before I started rambling about indentation, we can easily print every item in the fruits list by using a ‘for’ loop. Let’s make it do something more complicated than just print the fruits. Let’s have python add some words to each fruit. rottenfruit = "rotten " + fruit # changes each item to "rotten _____"
Did you follow all that?? This is the "for loop"
this is your "do something"
give a new list that is a result of the "do something"
But what if you don’t want to change every item in a list? We can use an ‘if’ statement to operate on only some items in the list. Let’s say we want to pick only the fruits that start with the letter ‘p’. This is not really needed, but it is nice to know. You can safely skip this. Python’s built-in function range() makes a list of numbers within a range that you specify. This is useful because you can use these lists inside of loops. If you have read the python explanation of loops, you are now masters of using loops. Let us use the loops with E+ objects. We’ll continue to work with the materials list. So now we’re working with two different lists: materials and thick_materials. But even though the items can be separated into two lists, we’re still working with the same items. Sometimes, we want information about the E+ object that is not in the fields. 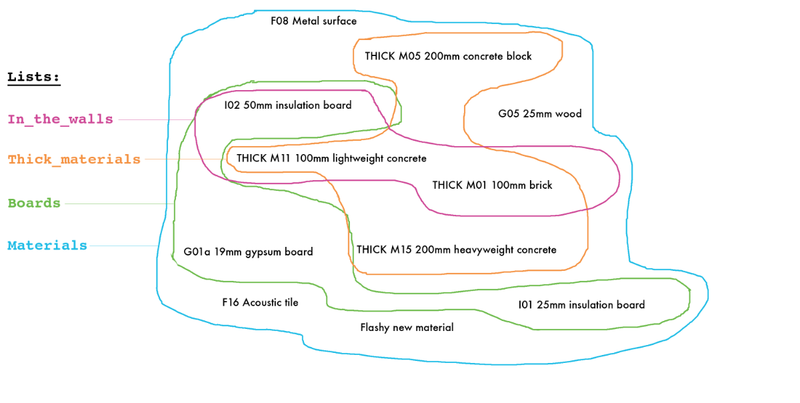 For example, it would be useful to know the areas and orientations of the surfaces. These attributes of the surfaces are not in the fields of surfaces, but surface objects do have fields that have the coordinates of the surface. The areas and orientations can be calculated from these coordinates. Pyeplus has some functions that will do the calculations. print "surface azimuth =",  asurface.azimuth, "degrees"
print "surface tilt =", asurface.tilt, "degrees"
print "surface area =", asurface.area, "m2"
You can see the “NORTHERN-WALL” in the print out above. This shows that very sophisticated modification can be made to the model rather quickly. © Copyright 2013, Santosh Philip. Revision 12e58c22.